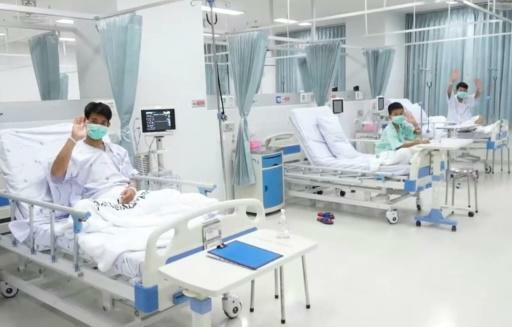 The "Wild Boars" football team are recovering in hospital following 18 days spent inside the Tham Luang cave after entering on June 23 and getting trapped by monsoon floodwaters. Doctors say they are in good health following a successful three-day operation which ended July 10 when teams of Thai Navy SEALs and international cave diving experts hauled the last five members of the team to safety. "All cried and expressed their condolences by writing messages on a drawing of Lieutenant Commander Saman and observed one minute of silence for him," Jedsada Chokdamrongsuk, permanent secretary at the health ministry, said in the statement. Photos released show the youngsters crowded around a sketch of Saman scrawling messages on it and bowing their heads in commemoration. Tributes from Thailand and around the world have poured in for Saman, a triathlete and diver who retired from the military in 2006 and worked at Bangkok's Suvarnabhumi airport before volunteering to help with the rescue in northern Thailand. Specialists who took part in the risky mission to bring the Wild Boars home have expressed shock and surprise that they were able to pull it off, with some fearing that there could have been more casualties. The unprecedented and daring final push to bring the boys out saw them sedated and carried through waterlogged and partially dry corridors with the help of military stretchers and nearly 100 divers. Health officials have conveyed a largely positive picture of the boys' recovery. All are expected to leave hospital on Thursday. The boys -- and their parents -- have been advised to spend time with friends and family and not to give media interviews as that could trigger post-traumatic stress disorder symptoms. But the interest in their story is unlikely to evaporate overnight, as Hollywood producers are already jockeying to make a film version of the saga.